Business apps for standing workers is a real and urgent need. 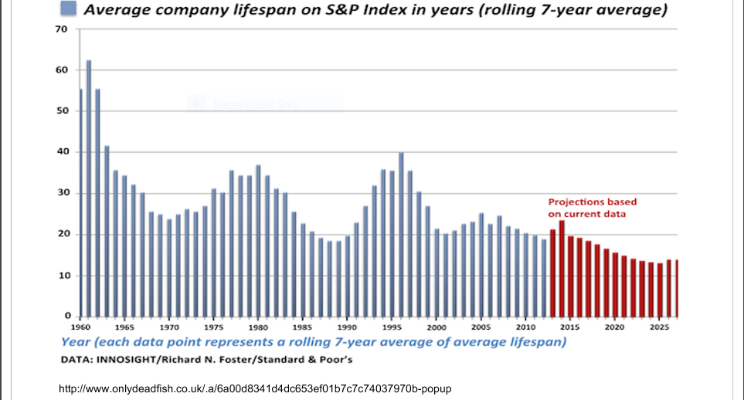 The chart at the top of this article shows that the average lifespan of companies on the S&P index has fallen from 61 years in 1961 to 20 years now and is projected to drop to less than 15 years in the coming years. This is very sobering data. What is causing this dramatic change? The most popular explanation is that the rate of change and the need for companies to adapt and innovate rapidly has increased dramatically. One of the biggest factors behind this change is that the cost of computing has plummeted along with major strides in software development. Currently one of the biggest game changing factors is the adoption of internal mobile business apps to make workers, who spend most of their time standing up and moving about much more productive and efficient in their jobs. In fact over 60% of the $2.5 billion workers world wide fall into this category. Until the advent of affordable and standardized mobile devices almost all of enterprise computing centered around making desk-bound workers more productive and ignored the stand up worker. Smart companies have realized that bringing the stand up worker into the 21st Century and away from pens and clipboards and notepads is essential for survival! They are aware of the trends clearly laid out in the graphic above. They know that making a commitment towards mobile is not just a cool thing to do, but is nothing short of essential if you want your company to be a survivor in today’s world. When picking a platform to get all these mobile apps built, enterprises have been telling us that the following criteria are important. C) be able to easily integrate with databases and system of record. 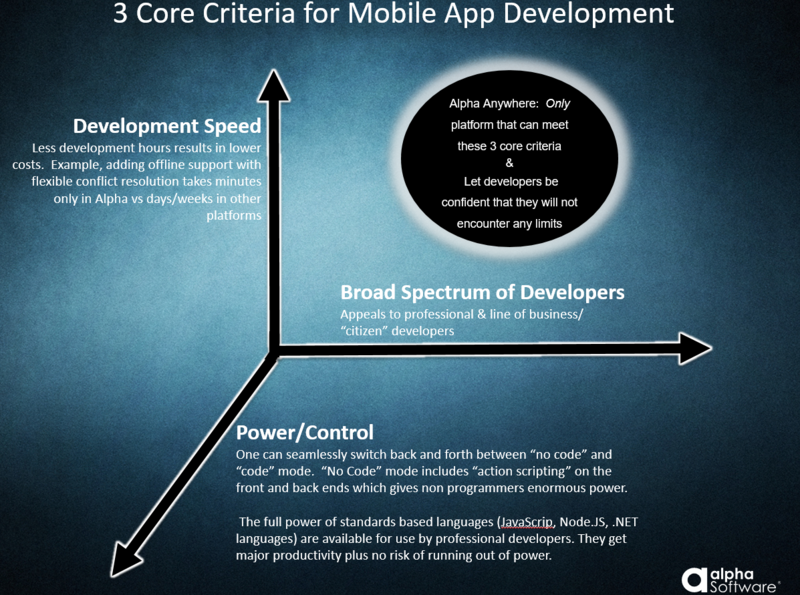 D) be easy enough to appeal to line of business developers and fast enough to let professional developers crank apps out really quickly! G) be designed around mobile form optimization to let field workers capture data and rich media accurately and quickly.